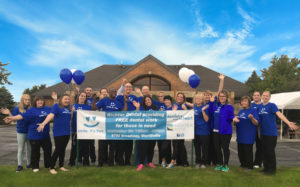 Richter Dental of 8750 Broadway in Merrillville, IN will host a Dentistry From The Heart event providing the first 50+ adults with FREE dental care on Friday, September 7th from 7:30 a.m. to 3:00 p.m.
Dr. Neal Richter at Richter Dental will host a one day free dental care event in Northwest Indiana with free dental services to the first 50 or more adults (18 years+), on Friday, September 7th, between 7:30 a.m. to 3:00 p.m. at the Merrillville office. This event is designed to give back to the community by helping those in need. The staff at Richter Dental will offer a free cleaning, filling, or extraction. There will be additional dental professionals, hygienists and dental assistants donating their time and resources to help as many people as possible. Many are without jobs and experiencing tough economic times. Providing dentistry is what Richter Dental excels in and therefore, they want to help others maintain their oral health to feel good about themselves as they try to gain employment and confidence. The media is invited to join the teams of volunteers, patients, and of course Dr. Richter, on Friday, September 7th, to help spread free smiles across Northwest Indiana. Adult patients are asked to arrive early as the event is organized on a first come, first served basis, and they may be waiting outside in line before they are to be seen. Richter Dental is the first in the area to offer a Dentistry From The Heart event and is thrilled to be hosting their 4th event. From improving smiles and confidence, to providing relief from suffering, Dr. Richter and the team at Richter Dental look forward to helping patients’ teeth and overall health, and of course, delivering a renewed reason to smile! Washington Dental Care and Smiles Pediatric Dentistry are proud to announce that they opened their doors to patients in Chicago, IL at 1229 W. Washington Blvd. The practices will provide dental services for the entire family that range from pediatric dentistry and preventive care to cosmetic dentistry. Washington Dental Care and Smiles Pediatric Dentistry will celebrate their grand opening on Friday, April 29th, and the entire community is invited! The festivities begin at 4 p.m. and will include Hors d’Oeurves and each guest will be entered into a raffle to win Sonicare gifts! The West Central Association of the Chicago Chamber of Commerce and Dr. Hammes and Dr. Rutherford will welcome guests with a special ribbon-cutting ceremony at 5 p.m.
Washington Dental Care and Smiles Pediatric Dentistry provide comprehensive exams, periodic exams, child and adult cleaning, performing sealants, crowns, and root canals for the entire family. Dr. Hammes is a native to the Chicago area, having grown up in Mt. Prospect, Illinois. He graduated from the University of Illinois at Chicago’s College of Dentistry in 2008. Upon graduation, Dr. Hammes began his dental career with the U.S. Navy, completing a one-year Advanced Education in General Dentistry residency. From there, Dr. Hammes served as the dental officer aboard two ships. He then served as division officer of Oral Diagnosis at Recruit Training Command Great Lakes. From 2013-2014, Dr. Hammes completed a one-year Fellowship in Implant Dentistry at the Southern Illinois University School of Dental Medicine in Alton, Illinois. Dr. Hammes is dedicated to excellent patient care in a comfortable environment, oral health, and staying up to date in the advances in dentistry through continuing education. Dr. Rutherford has been practicing in the Chicagoland area since 2004, after graduating from the College of Dentistry at the University of Illinois at Chicago. She completed her training in pediatric dentistry in 2006 to receive her certificate in this specialty, and is a diplomat of the American Board of Pediatric Dentistry. She places an emphasis on prevention with the children she treats, believing that early education and proper oral hygiene are the key to a lifetime of good oral health. Dr. Rutherford currently resides in Chicago with her husband and two daughters. More information about Dr. Hammes and Dr. Rutherford can be found by visiting washingtondentalcare.net and smileswestloop.com. What are dental implants and where to get them? Where can I find headache relief? To evaluate whether you have TMD, your doctor will check for a variety of symptoms, including clicking or popping of the jaw joint and diagnostic wear patterns of the teeth. Many patients suffer from severe bruxism or grinding of the teeth at night. This can be harmful to your teeth and cause TMJ pain. Some patients simply clench their teeth during the day or at night. Clenching of the teeth is usually linked to increased stress levels. People with clenching, grinding or bruxism habits wear their tooth’s enamel away faster than normal and more frequently suffer from TMD. Dr. Mark Ligocki invites you, your friends and family to his Oakbrook or Wheaton offices to learn all about the advantages of dental implants for the treatment of missing teeth. Dr. Ligocki will be hosting a separate open house at each location in order to accommodate a larger number of patients. Ligocki Dental Group will be holding a dental implant open house at their Wheaton office on Wednesday, November 12th from 5:30-7:30pm. The dental implant open house at their Oakbrook Terrace office will take place on Monday, November 17th from 5:30-7:30pm. At the open houses, patients will have the opportunity to tour the office, meet Dr. Ligocki and his staff, and learn about the procedure, it’s costs, and affordable financing options. Refreshments will be served. Dental implants are the most durable, functional, and natural tooth replacement option available today. The implant is comprised of a titanium post that serves as the root of your replacement tooth, a porcelain crown, and an abutment that attaches the crown to the implant. With proper oral care, a dental implant can replace a natural tooth for a lifetime. Oral health. With other tooth replacement options, the bone where the tooth root use to be may deteriorate over time, causing neighboring teeth to shift and loosen. Implants are the only option that helps prevent bone loss in the jawline. Reliability. Implant placement has a success rate of over 95%. Confidence. Implants are practically indistinguishable from natural teeth. You will never have to worry about your dentures slipping or whistling through a missing tooth. You can eat all the foods that you desire, and most of all, you will smile more confidently at work and at play with a full, healthy set of teeth. To stay updated about the dental implant open house, patients can visit Ligocki Dental Group’s Facebook and Twitter. Patients can also learn about Ligocki Dental Group by visiting their website at www.ligockidentalgroup.com. Dr. Mark Ligocki and his team at Ligocki Dental Group in Oak Brook and Wheaton have been serving the western suburbs for over twenty years. The practice emphasizes general family dental care as well as implants, nonsurgical gum treatments, and cosmetic procedures. Contact: Mark A. Ligocki, D.D.S. What’s Sweeter Than Sugar? Cold Hard Cash! Dr Ligocki says, “After Halloween we as parents realistically expect the kids to enjoy some of the candy they collect and then we are here to help them get rid of the excess.” That’s good news for kids, especially when early childhood decay is on the rise and obesity and diabetes rates among the young have skyrocketed. Kids can still have all of the fun of trick-or-treating, and now their piggy banks and their bodies will benefit as well. Candy will be collected at Ligocki Dental Group in Oakbrook Terrace the Monday after Halloween, November 3 from 5:30-7:30 p.m and at their Wheaton office on Wednesday, November 5th from 5:30-7:30pm. The candy must be unopened. No bites please. To commemorate this year’s Halloween Candy Buy Back, Dr. Ligocki will be collecting letters written by the children to the troops and be raffling off movie tickets in the “Guess how many candy corns there are contest”. Dr. Mark Ligocki and his team at Ligocki Dental Group in Oak Brook and Wheaton have been serving the western suburbs for over twenty years. The practice emphasizes general family dental care as well as implants, nonsurgical gum treatments, and cosmetic procedures. Dr. Ligocki is available to provide more information at (630) 620-8099 or (630) 665-7400, or visit Ligocki Dental Group on-line at www.LigockiDentalGroup.com. Another local business and one community group have volunteered to help via donations. If your business or organization would like to participate, please contact Ligocki Dental Group in Oak Brook. Dr. Justin A. Ahoyt of Ahoyt Family Dental to host free dental clinic day on September 5th, 2014 at his Plainfield dental office. Dr. Justin A. Ahoyt, dentist in Plainfield, is teaming up with Dentistry From The Heart for the third year in a row to provide free dental exams, tooth extractions, fillings, and cleanings on September 5th, 2014. Along with Ahoyt Family Dental’s full staff, a team of dental associates will be on hand to provide dental care for patients. Since its inception, Dentistry From The Heart has grown to include over 250 annual events nationwide and has served more than 80,000 people of need with free dental care. Last year, free dental care consisting of fillings, extractions, and dental cleanings was provided for over 100 participants. Over 20 volunteers, including doctors, family and sponsors helped make this day a huge success. Food and refreshments will be served throughout the day from local restaurants. A DJ will be playing music and engaging participants in trivia games. All patients 18 and over will be served on a first-come, first-served basis. A valid ID is required in order to verify the participant’s age. Patients will be seen from 8 A.M. to 4 P.M. at the Ahoyt Family Dental office in Plainfield. Dr. Ahoyt obtained his D.D.S. degree from the Indiana University School of Dentistry and now practices general dentistry in Plainfield at Ahoyt Family Dental. Dr. Ahoyt regularly participates in continuing education dental courses to stay up-to-date with the latest dental technology and techniques, ensuring that his patients continue to receive quality dental care. To learn more about Ahoyt Family Dental, please visit http://www.ahoytfamilydental.com. Dr. Ahoyt proudly serves patients from Plainfield, Aurora, Naperville, Yorkville, Oswego, and other surrounding areas. Dentistry From The Heart is a registered non-profit organization that provides free dental work for people who need it. In the past nine years, Dentistry From The Heart events have contributed more than $5.5 million in free dentistry and helped more than 80,000 patients across the country. For more information please visit http://www.dentistryfromtheheart.org. Dr. Sup would like to take this opportunity to graciously thank all her patients for their trust and confidence in permitting her to take care of their dental needs throughout the years. As you may know, there comes a time in life when family calls your name, and after much belabored thought, she has chosen to step back from the business of dentistry. It was her desire for her patients to be able to conveniently continue to receive dental treatment on a consistent basis. She wanted to be certain that all her patients continue to receive the best possible care. After carefully evaluating a number of dentists who were interested in assuming her practice, she selected Dr. Mark A. Ligocki, whom she believes possesses the highest qualifications and is extremely well skilled in all phases of dentistry. Dr. Sup will continue to practice with Dr. Ligocki on a limited basis as he will assume a more hands on approach in the daily operations of the practice. Equally important, the staff has happily agreed to stay on to reinforce a comfortable transition especially for the patients. Dr. Ligocki, with over twenty-five years experience, currently practices in Oakbrook, in a practice similar to Dr. Sup’s, which will ensure that the transition will be simple and smooth. He is from Naperville where he resides with his wife, JoanEllyn, and their two daughters, Jocellyn and Lauryn, both of which have interests in a future of dentistry. Dr. Ligocki received Bachelor of Science degrees from both Roosevelt University and the University of Illinois. He is a graduate of the University of Illinois College of Dentistry, which still ranks as one of the finest programs in the country. He is a member of several dental associations, authored numerous articles on topics in dentistry, lectured on dental implants, takes many hours of continuing education each year, and is the visiting dentist at a retirement community in Downers Grove, all while fitting in his hobbies of: family first, sports (mainly basketball and now lacrosse), and Koi pond water gardening. Dr. Ligocki is excited with the opportunity to expand his practice of dentistry into downtown Wheaton, as well as continue to practice in Oakbrook. For more information and to schedule a complimentary smile and whitening evaluation, please call his Wheaton office at (630) 665-7400 or his Oakbrook office a (630) 620-8099. Visit Dr. Ligocki’s website at www.LigockiDentalGroup.com. May is Cystic Fibrosis month. Dr. Mark Ligocki and his Ligocki Dental Staff are a corporate sponsor for the Naperville Great Strides walk on May 17, 2014 because he wants to raise awareness for Cystic Fibrosis. Cystic Fibrosis is a genetic disease the causes complications with the respiratory and digestive systems. Dr. Ligocki’s two year old nephew, Kilian, was diagnosed at birth with this disease. He takes daily medications and undergoes many breathing treatments each day. Cystic Fibrosis affects only approximately 30,000 children and adults across our country. As many of you know there are two things close to Dr. Ligocki’s heart, his family and his patients. During the month of May he is offering a free cosmetic smile consultation and a chance to win a professional take home whitening system with any donation placed at his either of his offices. Please help support the fight against this terrible disease to find a cure and make Kilian’s story a huge success by donating for a chance to whiten your smile. With your help we can find a cure for Cystic Fibrosis and put a smile on everyone’s face. For more information, appointments for the free cosmetic smile evaluation, and donations, please call Dr. Ligocki’s Oakbrook office at (630)620-8099 or his Wheaton office at (630)665-7400. Ligocki Dental Group offers a variety of dental procedures, ranging from cleanings and preventative treatments to cosmetic dentistry and implant treatment. It is their goal to provide patients with the highest quality, affordable dental care in Oakbrook and Wheaton. Their offices are equipped with the latest and most up-to-date technology, to better serve you. The Ligocki Dental Group staff is experienced with treating patients of all ages, and they welcome families to visit the office. To stay updated about dental health, patients can visit Ligocki Dental Group’s Facebook and Twitter at www.facebook.com/pages/Ligocki-Dental-Group/122341034501337 and www.twitter.com/drmarkligocki. Patients can also learn about Ligocki Dental Group by visiting their website atwww.ligockidentalgroup.com. This event, IT’S A SLAM DUNK TO END THE WORD, is open to the public and Dr. Ligocki encourages you to come out and enjoy a fun filled night of college students working with their Best Buddie peers in this exciting basketball game. The theme of the basketball game is centered around the Spread the Word to End the Word campaign. The campaign encourages the movement for ceasing the use of the R-word, retard (ed), and to promote the new word, RESPECT. There will be half-time games for the public to participate in and T-shirts and wrist bands available to support the cause. The concession stand will be open for drinks and snacks. Tip off is March 8 at 7:00 pm. Get there a little early for the best seats, admission is free and Best Buddies always will accept a donation to keep this great cause moving forward. The game is in the Rice Center on the Benedictine University campus located at 5700 College Road, Lisle, only 20 minutes from Dr. Ligocki’s office! Tell you family and friends about this great event because it’s going to be A SLAM DUNK TO END THE WORD! For anyone in attendance that gets a T-Shirt or wrist band from Best Buddies Ligocki Dental Group is offering a complimentary dental evaluation and FREE smile consultation when they present their T-shirt or wrist band at their appointment. Anyone interested in in supporting Best Buddies or the complimentary evaluation and consultation can call (630) 620-8099. Ligocki Dental Group offers a variety of dental procedures, ranging from cleanings and preventative treatments to cosmetic dentistry and implant treatment. It is their goal to provide patients with the highest quality, affordable dental care in Oakbrook. Their office is equipped with the latest and most up-to-date technology, to better serve you. The Ligocki Dental Group staff is experienced with treating patients of all ages, and they welcome families to visit the office.